When Do I Need To Start Repaying My Student Loans? How Do I Choose A Student Loan Repayment Plan? What Are The Repayment Options For Federal Student Loans? Can I Get A Cosigner Removed From My Loan? What Happens If I Can’t Pay My Loans? Once you are no longer enrolled at least half-time in an eligible program, you’ll receive a six month grace period on your Direct Subsidized and Unsubsidized Loans, during which you are not required to make loan payments. 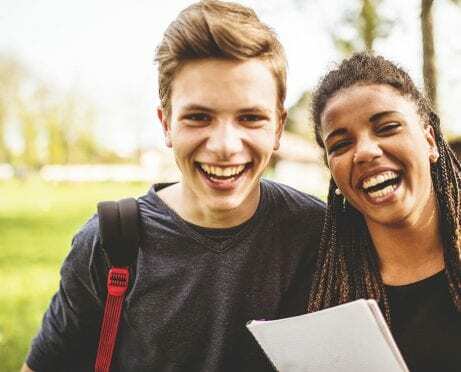 There is no second grace period – once you use the full six month grace period, you’ll have to start paying your federal student loans back immediately. There is no grace period for Direct PLUS Loans – you must begin repayment the day after the final loan disbursement is made. However, if you’re a graduate or professional student PLUS borrower, you can defer repayment while you’re enrolled in at least half-time and for an additional six months after you drop below half-time enrollment. Private student loans usually come with a grace period similar to the federal loans, but not always. Check with your lender and read the promissory note carefully. The Department of Education will automatically enroll you in a 10-year standard repayment plan for your federal student loans, but others are available. Review the government’s Repayment Estimator to see how much you would pay on various plans. Standard Repayment: fixed payments for up to 10 years (30 years for consolidation loans). Graduated Repayment: payments are low at first, and increase every two years for a total period of 10 years of repayment (30 years for consolidation loans). 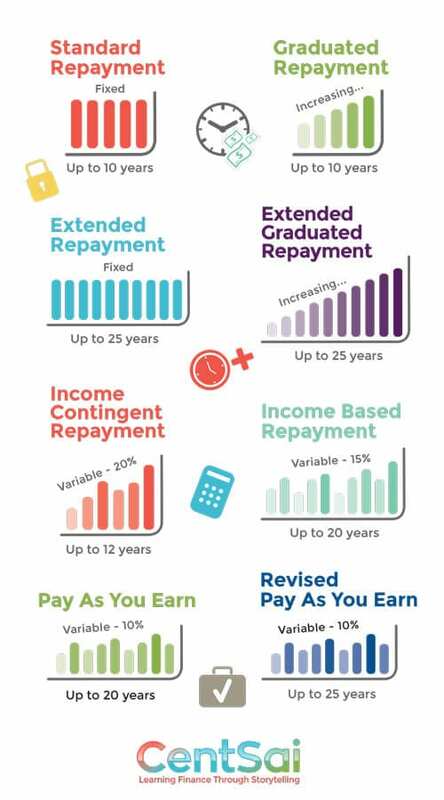 Extended Repayment: fixed payments for up to 25 years. Extended Graduated Repayment: payments are low at first and increase every two years for a total period of 25 years of repayment. Income Contingent Repayment: payments are set at 20 percent of discretionary income – or the amount you would pay on a repayment plan with a fixed payment over 12 years – calculated annually. Income Based Repayment: payments are set at 15 percent of discretionary income, calculated annually, for a maximum of 25 years. Revised Pay As You Earn: payments are set at 10% of discretionary income, calculated annually, for a maximum of 20 years (25 years if you have graduate loans). Not every repayment option is available for every type of federal student loan, so check with a professional before making a decision on which repayment option is best for you. Federal student loans do not typically have cosigners.The only exception is for some Direct PLUS Loans. For private student loans with cosigners, the requirements vary from lender to lender. As a general rule, private lenders will require you to have excellent credit and significant income before releasing a cosigner. Studies indicate that most lenders do not usually approve co-borrower release requests. If you can’t pay the amount due on a federal student loan, look to one of the income-dependent repayment plans to reduce you payment amount. If you are unable to pay the income-dependent amount due, consider a short-term forbearance until your situation improves. At the same time, speak with a budgeting professional to help you bring your income and expenses into balance so you can better afford your loan payments.For private student loans, call your lender to see if there are any ways to reduce your payments. Also look at your other debts and see if there’s a way to reduce or eliminate them. Credit counseling, debt settlement, and bankruptcy may help to get rid of your other debts, freeing up money to pay the student loans. Be sure to speak with a professional about whether these debt relief options are right for you. Here is a video that discusses your options if you hit a rough patch and are unable to repay your student loans.